♬Liner Notes♬: Yes! We've got some of the hottest sounds around this week from Conor Oberst, Tweedy, James and Nina Persson + even more exclusive live music from Jenny Lewis, The Preatures, Robert Ellis and My Brightest Diamond via KUTX at ACL Fest... Let's Pump Up Tha Volume! Notes: "It’s been six years since the former Rilo Kiley leader Jenny Lewis released Acid Tongue, her last solo album, and she return[ed] this summer with the new one The Voyager. Ryan Adams, along with frequent collaborator Mike Viola, produced most of the album, but he wasn’t behind lead single “Just One Of The Guys.” Instead, Beck, Lewis’s peer in sunnily heartbroken California singer-songwriterdom, produced the song. It’s a warm, pretty country-rock lope about never quite fitting in." Notes: "Listening to the Preatures, you're always just one thought away from identifying the band they most closely echo... Eventually, the realization hits: There's no band out there that sounds exactly like the Preatures, but damnit, there should have been one a long time ago. The Preatures have been building hype out of their home country of Australia for a couple years... Now they've arrived on American shores with their recently released debut LP, Blue Planet Eyes, a welcome ten-song blast that matches the energy of an underground basement gig with the ambition of an arena rock show." Notes: "With a whiskey-worn voice that would make Tom Waits proud, the LA-via-Nashville artist Pony Boy’s ragged country captures the gutter-laden spirit of both cities. Choosing her moniker after the protagonist of S.E. Hinton’s The Outsiders, Marchelle Bradanini began the Pony Boy project in 2010 after the breakup of her previous group... After playing shows and sporadically releasing material in LA for a few years, Bradanini moved to Nashville and recorded her new EP, The Devil In Me with producers Adam Landry and Justin Collins on an eight-track recording machine." Notes: "Longtime DJ and acclaimed music supervisor (for shows like True Blood, Dexter, Six Feet Under) Gary Calamar will release his solo debut next week on Atlantic Records. He’s been playing guitar for years but emerged on a songwriter when Iggy Pop and Best Coast’s Bethany Cosentino recorded a track he wrote for Season 5 of True Blood called “Let’s Boot and Rally”. Many of the songs on the EP, entitled “You Are What You Listen To”, started as demos around that time... "
"Get Down Off That Thing"
Notes: "So Cow’s punk and lo fi-informed garage rock is engaging not only because of its scratchy, loose aplomb, but also because of its casually-delivered lyrical depth. Although now based in the Republic of Ireland, frontman Brian Kelly began So Cow as a solo home recording project in Seoul, South Korea... Now on their fifth album, this year’s The Long Con, the trio have toured internationally and briefly gained notoriety... The opening track on The Long Con, “Get Down Off That Thing” is a self-aware look at aging at a breakneck pace." Notes: "Right on the heels of the release of their first album, Sukierae, Tweedy unleashed a quirky, cameo-filled music video for their track "Low Key" that takes a lighthearted poke at a troubled record industry. Directed by Parks and Recreation's Nick Offerman, the video highlights the alt-rockers' DIY ethic while demonstrating some unusual efforts to sell the album." Yes, that's the Wilco main man and his son! I remember seeing them together in the beginning of the "Heavy Metal Drummer" video a decade or so ago! Notes: "Toronto trio Elliott Brood are set to return with Work and Love later this month, but for now, they've shared another new track called "Nothing Left." Taken from the forthcoming album — which was inspired by acts like Neil Young and Crazy Horse, Richard Buckner and Whiskeytown — the new cut takes a ragged, rock'n'roll approach to the rootsy music the band is known for... "Nothing Left" is sure to be a stomp-along live favourite from the new collection of songs." Notes: "Nate Martinez, the man behind Brooklyn’s Thieving Irons, is probably familiar to most KEXP listeners as, formerly, one-fourth of the notable but now extinct band Pela. Five years and several celebrated releases have surely proved multi-instrumentalist Martinez’s significance as a solo artist, beyond his early days in one of KEXP’s favorite acts and his collaboration with another, The National. Amid his relative quietness since 2012, Martinez has stayed busy working on plenty of new material, including his latest EP, Phenomena, which he calls his most recent work some of the best under the Thieving Irons moniker." Notes: "With a veteran group like James, it can be easy to praise them for merely outlasting many of their contemporaries as they diligently issue another solid late-career album. Such is the fate of many rock stalwarts in the eyes of the press and public. But 30 years on from their humble beginnings in early-'80s Manchester, James have aged gracefully, staring down their own mortality (both as a band and as individuals) with aplomb on their powerful 13th album, La Petite Mort (The Little Death)... Even in reflection, he's more concerned with processing the moment and how to deal with what comes next, as on the band's uplifting single "Moving On."" I got to see the legendary James on the not-so-legendary final touring Lollapalooza in '97 with Snoop, Korn, Tool and my man Tricky. Notes: "Nina Persson, the Swedish singer who has fronted the playful pop-rock band the Cardigans on and off since 1992 and has also featured in the trio A Camp, released her debut solo album Animal Heart this year. One of the standout tracks was the pulsing mid-tempo disco track “Food For The Beast,” which now has an eye-catching video by Tomas Melinder of the Malmö creative firm Top Dollar. The clip finds Persson behind and in front of various flashes of light — disco balls, video projections, undefined ethereal glimmers — while continuing to be the charismatic performer we’ve always known her to be." Notes: "In 2011, Houston’s Robert Ellis made a sizable splash with his New West Records debut Photographs. The long-haired singer got a write-up in The New York Times and headlined tours across the country, and it’s easy to understand why... Flash-forward a few years: Ellis has cut his hair and moved to Nashville, two acts that are tantamount to treason here in the land of Willie Nelson... This year’s The Lights From The Chemical Plant incorporates his life-long love of jazz into his honky-tonk ramblings, just like Willie Nelson did before him, and Bob Wills did before Willie. We caught up with Ellis backstage at ACL Fest 2014 for a stripped-down performance." Notes: "For Shara Worden, her musical education is never complete. The vocalist behind My Brightest Diamond was classically-trained at the University of North Texas, but she’s equally adept in more pop-oriented ensembles. She’s toured as a part of Sufjan Stevens’ band; featured on the Decemberists’ 2009 record The Hazards Of Love; and collaborated with David Byrne... It was interesting to hear My Brightest Diamond strip these elements down backstage at ACL Fest 2014. With just a three-piece setup, Worden filled in the spaces with her percussive guitar-playing and otherworldly voice." Notes: "Berlin-based alt pop band Ballet School, a trio...straddle the line between traditional style and new electronic with their pseudo-synth sound and energetic rock ‘n’ roll set up. The balance works for them on their debut, The Dew Lasts An Hour, melding mellifluous guitar, breakneck beats, and pop-soaked vocals to create a concurrently fresh and retro sound. It just seems right that a song called “Heartbeat Overdrive” would leap right into an intricately layered beat." Notes: "At 34, the former indie-rock prodigy still writes and sings about the high times and bad choices of adolescence, on the way to matured love and responsibility, like the sharpest kid in the room: a florid Midwest Morrissey with Jeff Tweedy's twisted-pop savvy. "What a time to live among the ashen remnants of a love/That came before," Oberst sings in "Hundreds of Ways," against a sambalike sway, country guitar and brass. "I'm still looking for that now," he adds eagerly. Oberst faces west and backward, brilliantly, on Upside Down Mountain. A sumptuous immersion in Seventies California folk pop, it is the most immediately charming album he has ever made." 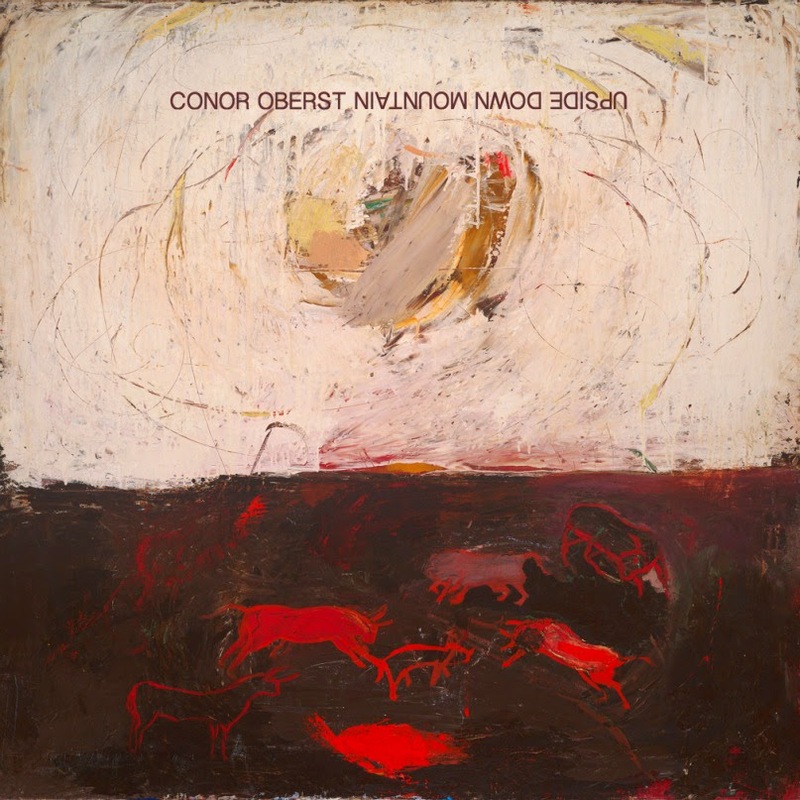 We heard "Ziggzagging Towards The Light" from 'Upside Down Mountain' back in June when the record came out and, um... Did I mention that I interviewed Conor a few weeks ago? Notes: "Local [Seattle] artist Eggshells is a tough egg to crack. From the remnants of previous bands In Praise of Folly and Can the Boy Tell Time, singer/songwriter Peter Verdoes ventures out with the aptly-titled debut, LP1. Verdoes calls upon his siblings Benjamin (Iska Dhaaf/Mt. St. Helens Vietnam Band) and Marshall (Scarves/Mt. St. Helens Vietnam Band) for support on the new release, plus, Sam Miller (Ravenna Woods/Sean Nelson/Mt. St. Helens Vietnam Band) and Matthew Dammer (Mt. St. Helens Vietnam Band/In Praise of Folly). Iska Dhaaf’s other half Nathan Quiroga makes a special guest appearance, as well. True to such an eclectic collection of musicians, the sound of Eggshells is a scramble of trip-hop and garage rock, with a psych-rock feel." Hear a clip of "Bury Our Friends," the first new Sleater-Kinney song in 9 years! Listen to @jamesblake's new track "Building It Still"
@TheBlackKeys' @PatrickCarney says @U2 "devalued their music completely"
I also got to see and interview the @youngrebelset in @TheBingLounge too! But I get excited every time I see @Sloanmusic on the marquee!